Pomigliano's new body-in-white line (shown) offers a level of flexibility never seen in a Fiat plant. POMIGLIANO, Italy – Fiat S.p.A.’s refurbished Pomigliano plant will serve as the “blueprint” for creating new plants and retooling existing Fiat-Chrysler factories, said Stefan Ketter, head of manufacturing for the two automakers. “Pomigliano uses the world highest production standards and it will become the blueprint for what we will do in Mirafiori, Italy; in Serbia, in the U.S. and China,” Ketter said at the launch of the new Fiat Panda here. Fiat invested 800 million euros ($1.04 billion) to refurbish a 39-year-old former Alfa Romeo plant to increase its capacity to 270,000 units a year from about 150,000. Fiat needs the high capacity to cover the expected high demand for the third generation of Europe’s best-selling minicar, the Panda. 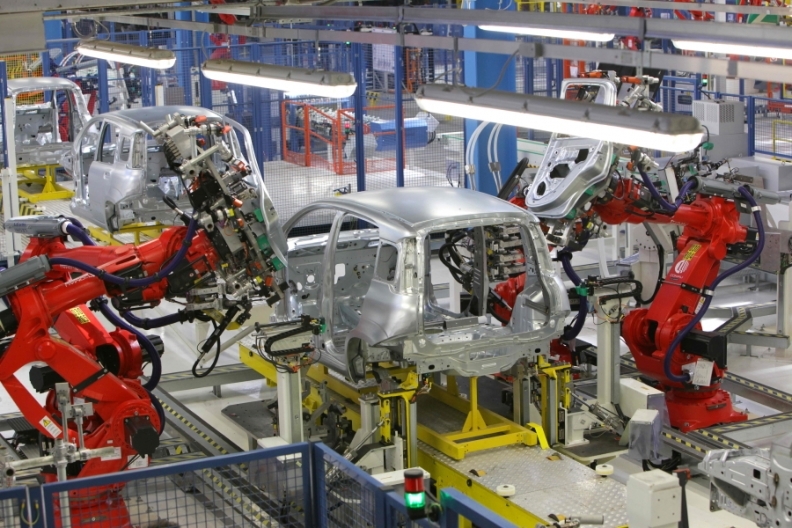 Pomigliano’s completely automated bodyshop uses 600 robots including an optoelectronic machine, which controls some key measures for each body-in-white built. Up to 15 units a day are taken off the line to have 2,000 points checked in the metrology center. Pomigliano’s new body-in-white line offers a level of flexibility never seen in a Fiat plant. “The new line is able to handle everything from an A-segment model [the Panda] to a D segment,” said Paolo De Fazio, head of the body-in-while shop. Fiat recently stopped making the mid-sized Alfa Romeo 159 at the plant to make room for the Panda. Fiat currently plans to keep Pomigliano as its second European production center for its Mini architecture models. The other is Tychy, Poland, which Fiat makes 500 and Ford Ka minicars as well as the current-generation Panda, which will be renamed the Panda Classic and will remain in production until the end of 2012. The new Panda will be sold in 40 markets, mainly in Europe. A small numbers of Pandas will be exported to Brazil and Japan, but not to China, India or the United States, Fiat brand CEO Olivier Francois said. To train workers for the new Panda, Fiat installed a pilot final assembly line in Pomigliano, which will remain active until next spring, when the plant is expected to reach its full capacity of 1,050 units a day. Production is currently ramping up at a pace of 100 units a day made by a work force of about 600. Before joining the main line, workers will be trained on the pilot line.